Before we decided to purchase a pair of adult LEGO hands, we thought it would be responsible to come up with a pros and cons list to mull over the benefits of having regular hands versus c-shaped LEGO hands. Here is what we came up with. 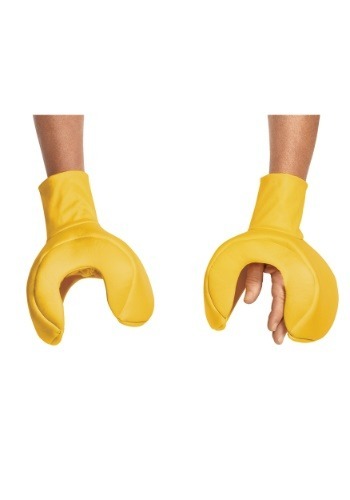 Pros: These LEGO hands will complete our adult LEGO guy costume perfectly, they'll also look great with a LEGO Batman or Joker costume, these mitts will get us notice wherever we go, and this is one awesome and unique accessory. Cons: High-fiving our buds will be nearly impossible. Handshakes? Forget it. Opening cans of soda, bottles of ketchup, and tubes of toothpaste will be nearly impossible. Holding just about anything will be challenging. The Verdict: We bought these LEGO hands! Why? Because they're epic and a list of cons a mile long couldn't change our minds! If you feel the same as us then this accessory is perfect for you. Made from polyester fabric and foam, these gloves feature plush c-shaped appendages attached to the ends of each glove. They easily slip on and feature palm openings so you can reach your hands through. Holding things like beverages and food won't be so hard after all! We can guarantee that these LEGO gloves will become your favorite accessory. Why wait til Halloween to wear them? Start wearing them right....now!